Editor’s note. This appears in the April digital edition of National Right to Life News. We are counting on you to forward stories from the issue to your pro-life contacts. This description is literally nonsense. “Pregnancy” isn’t a thing in the womb that you can remove. Pregnancy isn’t a thing at all. It’s a state or condition of a woman during which she carries her developing offspring. Virtually everyone understands this. Every dictionary says it. Is it possible that an organization called Planned Parenthood doesn’t know what pregnancy is? The more plausible explanation is that Planned Parenthood and others in the abortion movement have a serious problem acknowledging reality. And this problem seems worse now than ever. “An abortion … kills the life of a baby after it has begun,” wrote Planned Parenthood in a 1952 pamphlet. That was then. After it began performing abortions, Planned Parenthood didn’t want to call unborn humans “babies” anymore. After all, most people think that killing babies is wrong. What about “embryo” and “fetus”? These are scientific terms for human beings during the prenatal (embryonic and fetal) stages of their development. Although the terminology may sound foreign or clinical (and thus is sometimes used in a dehumanizing way), it accurately acknowledges the existence of an individual member of our species. That’s a fact of biology that’s not in dispute. But Planned Parenthood doesn’t like to concede even this. Instead, the organization often refers to embryos and fetuses with words and phrases like “tissue,” “uterine contents,” and “products of conception.” As descriptions of living human organisms (human beings), these are highly misleading and dehumanizing euphemisms. Sometimes, though, Planned Parenthood takes euphemism to a whole other level. Terms like “products of conception” at least acknowledge that something exists that is acted on in an abortion. That’s why the abortion is performed in the first place—there’s something in the womb that the abortion practitioner tries to remove. Calling an unborn child “the pregnancy” is different because the word “pregnancy” means the mother’s condition rather than the entity inside her womb. It’s a way of pretending, as absurd as it is, that only the pregnant woman exists—there is no one with whom she is pregnant. 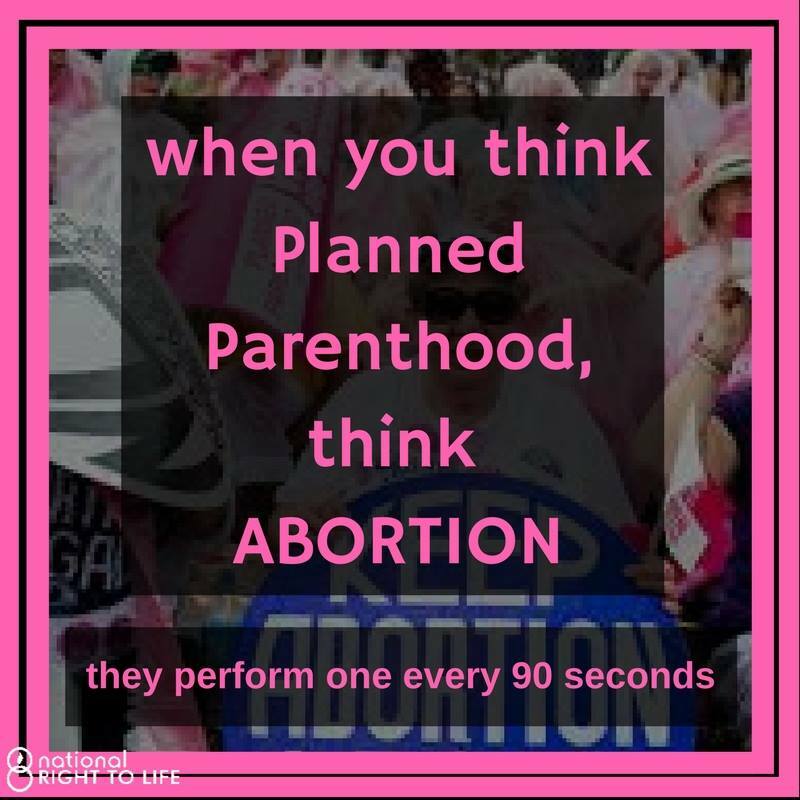 Likewise, Planned Parenthood vigorously employs terms like “women’s health care” to describe the intentional killing of individuals who are not women. Planned Parenthood thus rhetorically subsumes these individuals under their mothers so that their fate falls within the domain of the mothers’ health. The legislation has no effect whatsoever on women’s health. Their health care doesn’t require the denial of health care to infants who are already born. So what on earth is Planned Parenthood talking about? Instead of arguing for its position that abortion survivors shouldn’t receive ordinary medical care—instead of calling them some dehumanizing label—Planned Parenthood is pretending that those newborn babies don’t even exist. They are merely part of women. Only women and their health care exist. This is the current state of Planned Parenthood’s rhetoric. Twenty-four years later, the rhetoric to which the abortion movement clings is even more evasive—and perhaps more desperate. It’s a textbook example of Orwellian doublespeak. The purpose of doublespeak is to use language to obscure reality. The reality Planned Parenthood aims to obscure is no mystery—it’s the reality of the helpless human beings whom the organization routinely dismembers and kills. (The organization calls this process of tearing off arms and legs a “gentle” procedure “to empty your uterus.”) Planned Parenthood wants everyone to pretend that those humans simply aren’t there. But they are. Denying reality doesn’t make it go away.